WOMEN’S QUALITY CLOTHING – MADE FOR YOU! New! Linen with stretch! Everything you love about linen trousers, now with extra comfort. Sail into summer in a Supima Polo Smoother, softer and stronger - our most refined polo, ever. Get your best beach body ever! Stunning prints, clever shaping, simply beautiful swimwear. THE BEST Our flagship collection of premium summer vests, T-shirts and Polo Shirts crafted in the finest fabrics. Quality. Guaranteed. 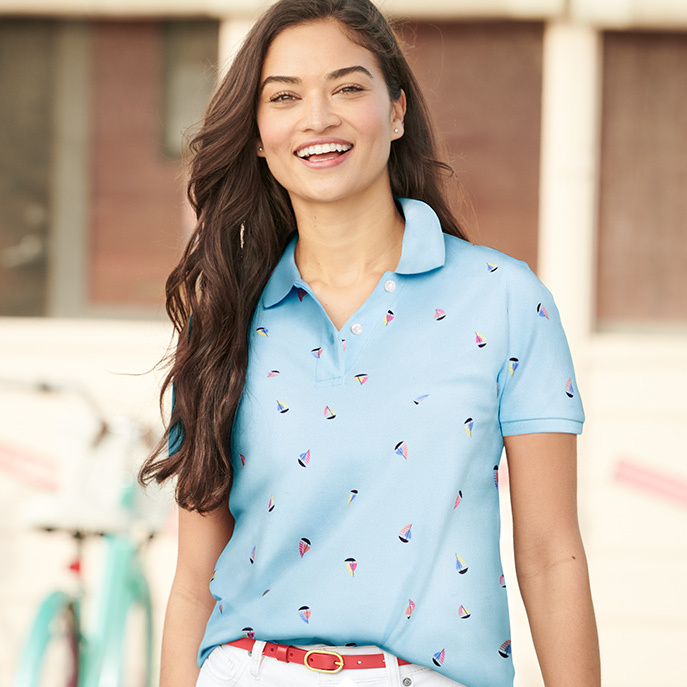 At Lands’ End we know the importance of style confidence. That’s why we are passionate about creating beautiful women’s clothing that’s fashionable and well made with attention to detail and, of course, comfortable to wear. Find a style for every season in our range of women’s coats and jackets. From slaloming down the slopes in one of our high-spec, high-tech jackets and a pair of ladies ski pants, or layering up in our cosy women’s gilets and winter-proof thermal tops for added warmth, to welcoming milder spring days with our fantastic range of lightweight women's styles, including light-as-a-feather fleece and down jackets and waterproof rain coats. Spring layering is made easy with our stunning selection of ladies knitwear. Choose one of our beautiful ladies cashmere jumpers, cool cotton sweaters and classic cardigans, available in a selection of timeless colours to fit easily into your wardrobe. Find your new favourite jeans with our delectable denim styles. Our ladies jeans are available in a choice of fits, leg shapes and colours from true blues to stain-resistant white jeans and stylish black jeans, so you can pick the one that flatters you most. With just the right amount of stretch our women’s jeans are designed to be your go-to choice for when you want comfort and style. Add a pop of colour to your look with our flattering cords, or choose a pair of our classic ladies chinos. If you want bold and beautiful, choose fashion forward patterned trousers and crops. Whatever your personal style our selection of women’s fashion is there to suit your every mood.